(Kabul, February 13, 2017) – Pakistani authorities have carried out a campaign of abuses and threats to drive out nearly 600,000 Afghans since July 2016, Human Rights Watch said in a report released today. The returnees include 365,000 registered refugees, making it the world's largest mass forced return of refugees in recent years. 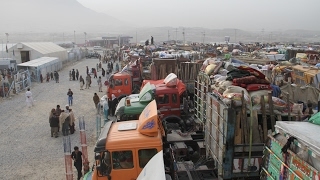 They now face spiraling armed conflict, violence, destitution, and displacement in Afghanistan. The 76-page report, "Pakistan Coercion, UN Complicity: The Mass Forced Return of Afghan Refugees," documents Pakistan's abuses and the role of the United Nations High Commissioner for Refugees (UNHCR) in promoting the exodus. Through enhancing its "voluntary repatriation" program and failing to publicly call for an end to coercive practices, the UN agency has become complicit in Pakistan's mass refugee abuse. The UN and international donors should press Pakistan to end the abuses, protect the remaining 1.1 million Afghan refugees in Pakistan, and allow refugees among the other estimated 750,000 unregistered Afghans there to seek protection, Human Rights Watch said.